Welcome to Festival Outlook, a new supplemental column that will provide more in-depth analysis for the rumors found on Consequence of Sound’s Festival Outlook. With the 2014 lineup announcement just days away, Alex Young and Frank Mojica get us started with a discussion on all things Coachella. Alex Young (AY): This is the first time in a long while that we know such a substantial portion of Coachella’s lineup prior to the January announcement. Arcade Fire and OutKast are a lock to each headline a day, and it’s looking increasingly likely that Muse are the third headliner, or possibly a co-headliner alongside Nine Inch Nails. Other heavily rumored acts include Neutral Milk Hotel, CHVRCHES, HAIM, Mogwai, Empire of the Sun, Pixies, Placebo, and Lorde. My question to you, Frank, is why do you think Coachella has had such a difficult time keeping this year’s lineup under wraps? Also, do any of the aforementioned acts surprise you? 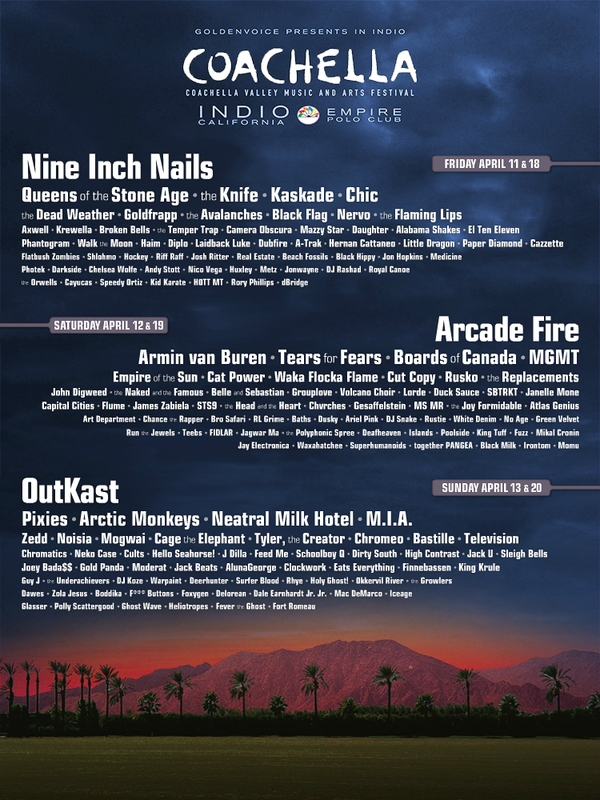 I think most people assumed Coachella would eventually book OutKast and Neutral Milk Hotel. Frank Mojica (FM): The 2014 experience has definitely been a different one from last year. I remember 2013’s headliners were assumed to include Daft Punk and The Rolling Stones well into January. If Coachella is like Christmas for adults, then this year’s lineup takes me back to the year when my parents just dumped all the presents into the extra bedroom, rather than wrapping or hiding them right away, so I knew almost everything I was getting. As for why this has been the case, I think things have gone well in the booking process, so most headliners and major acts have been secured for a while, rather than at the last minute. I recall reading that Red Hot Chili Peppers were literally signed to headline hours before the poster was released. None of the current rumors surprise me, except OutKast, which would have been a major jaw-dropper had the secret been kept under wraps. The surprising part about OutKast isn’t that they’re playing Coachella, but that they are finally together and touring again. Although Neutral Milk Hotel’s sudden reunion came as a surprise, I knew that it would eventually include a visit to the Polo grounds. Yes, this is a fake. Muse looks likely, but I have a feeling that Tool might surprise us. Imagine if Tool and Nine Inch Nails co-headlined a night. That would be one for the ages for all of us that were angry adolescents in the ’90s. Of course, all this is just speculation on my part, although I did have a dream that it happened. So, the cat is out of the bag for Arcade Fire, OutKast, Neutral Milk Hotel, and seemingly every 2013 rookie with good publicity. However, there are always left field reunions and unexpected rarities every year. AY: For all we already know, there are still many questions left to be answered. Will The Replacements continue their reunion activities into 2014 and finally hit the Polo Grounds? What about Sleater-Kinney? The band recently reunited onstage during a Pearl Jam concert, and with Wild Flag no more, it certainly seems like that reunion is on the table. Boards of Canada were on many folks’ list last year, and their absence from 2013’s lineup was especially surprising given their album release. The same can also be said about The Knife, of course. If I had to guess, I’d expect at least three of those acts to end up on the lineup. One of my favorite parts about Coachella, and all festivals for that matter, is how high (or low) an act is placed on a lineup. If Sleater-Kinney does end up playing, I can’t envision them being any higher than the third line. On the flip side, I can’t imagine Foster the People being on anything but the second line. I raised this possibility earlier, but if Muse and Nine Inch Nails are booked for the same day, will they be listed as co-headliners, or will Muse get stand-alone billing? These days, Nine Inch Nails is nowhere near as big a band as Muse is, at least by mainstream Top 40 standards, but I could totally see a Stone Roses/Blur situation purely out of respect for Trent Reznor. I also think Tool is a possibility, especially given their dates scheduled in South America in the weeks prior to Coachella. Though, I’m not sure their booking makes sense in a year where Arcade Fire and OutKast will also headline. Last week someone on the Coachella message board argued that OutKast would be a sub-headliner if it were not for their reunion, and I tend to agree. Them getting back together is huge news for rabid music fans and blog readers, but do André and Big Boi have the pull to draw 60,000? I think that remains to be seen. Arcade Fire are at the height of their popularity right now, but I think the left field direction of Reflektor and their recent bit of quirkiness (e.g., dresscodegate) make them a similar draw to Phoenix last year. And what did Goldenvoice end up doing to mitigate the risks of booking two UK-centric reunion acts and an arena-status indie band as headliners? Book Red Hot Chili Peppers, who are still the biggest rock band around, like it or not. That’s why I have a hard time seeing Goldenvoice opt for Tool over the much more popular and safe Muse.